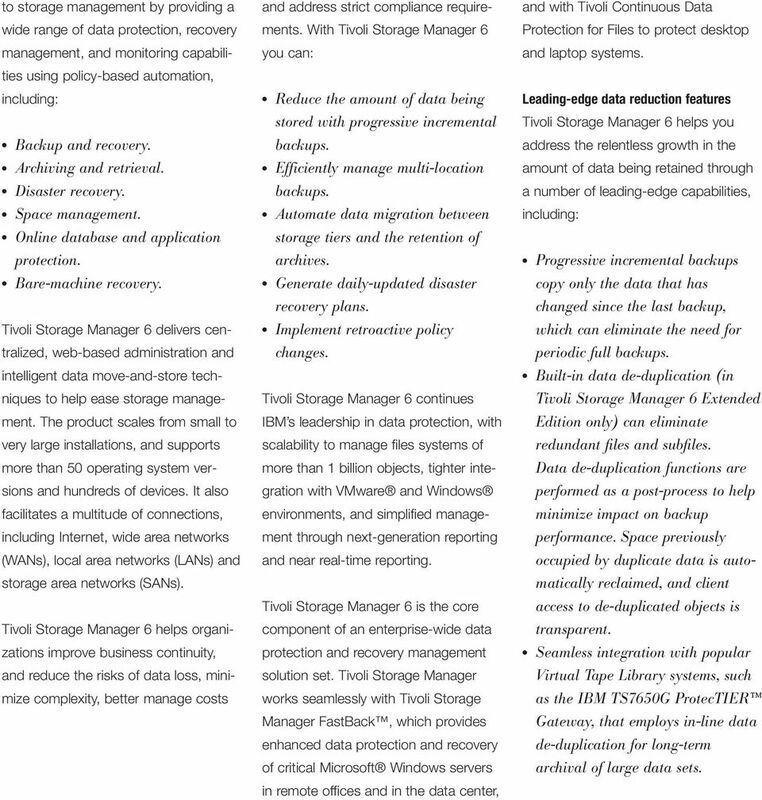 Download "IBM Tivoli Storage Manager 6"
2 to storage management by providing a wide range of data protection, recovery management, and monitoring capabilities using policy-based automation, including: Backup and recovery. Archiving and retrieval. Disaster recovery. Space management. Online database and application protection. Bare-machine recovery. Tivoli Storage Manager 6 delivers centralized, web-based administration and intelligent data move-and-store techniques to help ease storage management. The product scales from small to very large installations, and supports more than 50 operating system versions and hundreds of devices. It also facilitates a multitude of connections, including Internet, wide area networks (WANs), local area networks (LANs) and storage area networks (SANs). Tivoli Storage Manager 6 helps organizations improve business continuity, and reduce the risks of data loss, minimize complexity, better manage costs and address strict compliance requirements. With Tivoli Storage Manager 6 you can: Reduce the amount of data being stored with progressive incremental backups. Efficiently manage multi-location backups. Automate data migration between storage tiers and the retention of archives. Generate daily-updated disaster recovery plans. Implement retroactive policy changes. 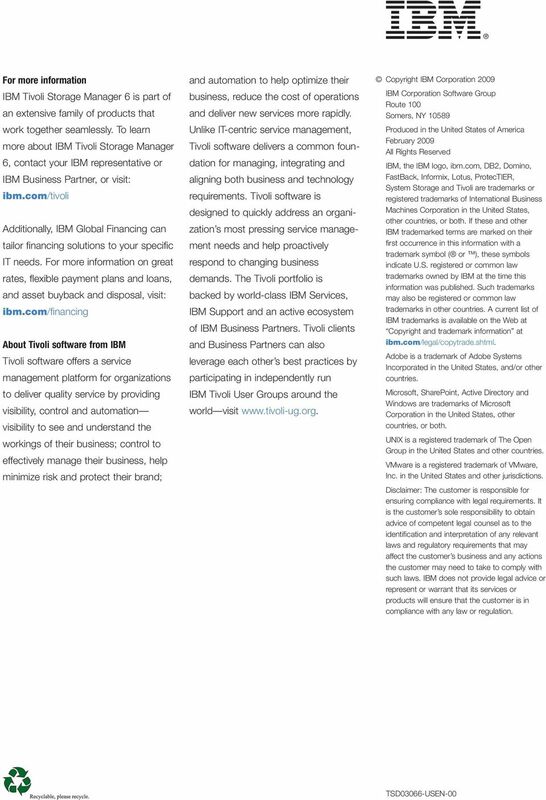 Tivoli Storage Manager 6 continues IBM s leadership in data protection, with scalability to manage files systems of more than 1 billion objects, tighter integration with VMware and Windows environments, and simplified management through next-generation reporting and near real-time reporting. 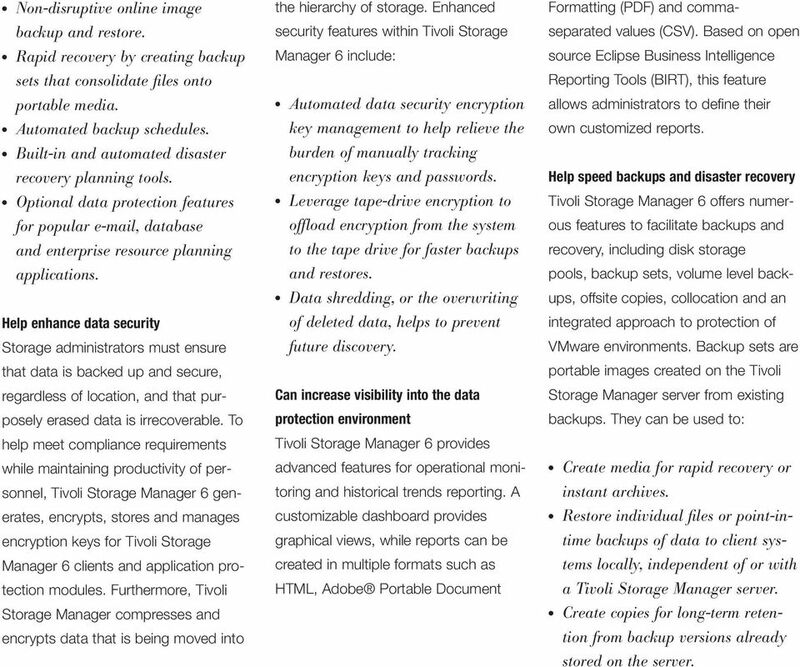 Tivoli Storage Manager 6 is the core component of an enterprise-wide data protection and recovery management solution set. Tivoli Storage Manager works seamlessly with Tivoli Storage Manager FastBack, which provides enhanced data protection and recovery of critical Microsoft Windows servers in remote offices and in the data center, and with Tivoli Continuous Data Protection for Files to protect desktop and laptop systems. Leading-edge data reduction features Tivoli Storage Manager 6 helps you address the relentless growth in the amount of data being retained through a number of leading-edge capabilities, including: Progressive incremental backups copy only the data that has changed since the last backup, which can eliminate the need for periodic full backups. Built-in data de-duplication (in Tivoli Storage Manager 6 Extended Edition only) can eliminate redundant files and subfiles. Data de-duplication functions are performed as a post-process to help minimize impact on backup performance. Space previously occupied by duplicate data is automatically reclaimed, and client access to de-duplicated objects is transparent. Seamless integration with popular Virtual Tape Library systems, such as the IBM TS7650G ProtecTIER Gateway, that employs in-line data de-duplication for long-term archival of large data sets. 3 Can increase efficiency with a hierarchy of storage In most storage management environments, managed data is trapped on the media to which it was originally backed up. Tivoli Storage Manager 6 manages data stored in a hierarchy of lower-cost storage, which helps conserve resources as automated policies migrate data to the appropriate media type, based on data value and retention requirements. Tivoli Storage Manager 6 automatically manages the movement of the data onto new storage technology when introduced into the hierarchy, allowing you to remove old technology from the IT center. In addition to this storage hierarchy, the open application programming interface (API) of Tivoli Storage Manager 6 provides the ability to seamlessly manage many types of data. As soon as data is in the hierarchy, it can easily be moved from one storage device to another. Use Tivoli Storage Manager 6 for: Backup backup and maintain numerous file versions to enable point-in-time recovery in the event of production storage device failure, data errors or accidental file deletions. Archive archive files to the hierarchy of storage for a specified amount of time, after which they automatically expire, based on policies set for each data type. 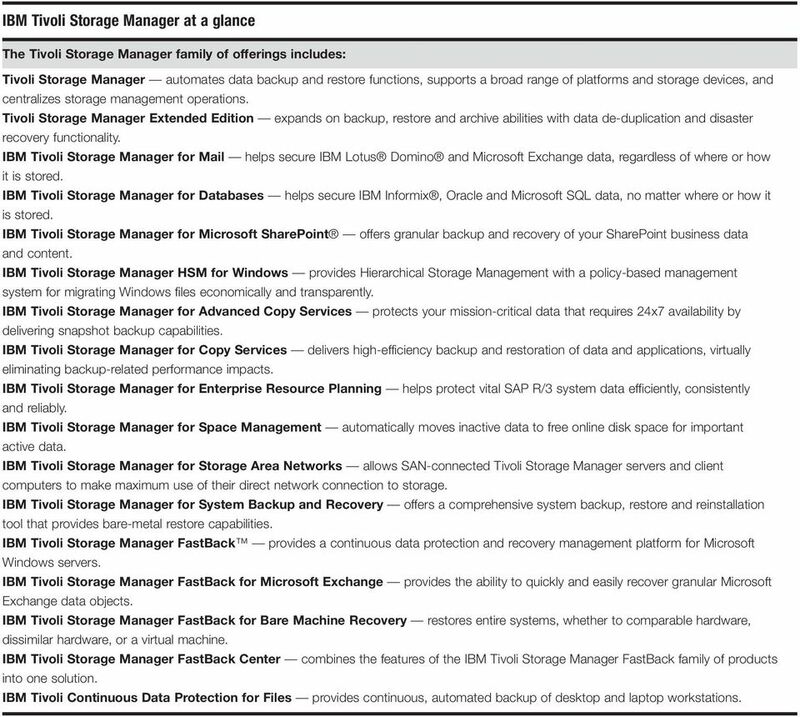 Space management IBM Tivoli Storage Manager 6 for Space Management identifies and moves less-frequently accessed and inactive files to the hierarchy of storage. IBM Tivoli Storage Manager 6 HSM for Windows enables you to migrate lesser-used Windows files without disrupting your end users. Data retention enforcement IBM System Storage Archive Manager 6 prevents stored data from being changed or deleted prior to expiration dates or while a hold is placed on the content, helping organizations address regulatory requirements. Leverage an advanced architecture for robust functionality Tivoli Storage Manager 6 provides superior functions for managing data because it utilizes an integrated enterprise-class IBM DB2 relational database and transaction log to track the managed data s metadata. Other storage optimization features help reduce capacity requirements, speed installations, and automate backups and recovery processes. Storage features Intelligent data movement to save tapes, processing cycles and network bandwidth. Flexible storage pools to migrate data from one storage pool to another based on policies set up to reflect business needs. Direct-to-disk storage so the number of client machines moving data is not controlled by how many tape drives are available, nor is the data fragmented by cumbersome multiplexing techniques. Reclamation of space to free up partially used tapes by moving active files to other tape volumes. Seamless scalability to support the growing data protection and recovery management needs of almost any organization. Backup and recovery features Collocation to dedicate a set of tapes to a single user or group of users. Offsite copying for disaster recovery purposes. Better tape utilization through automated reclamation and migration. Re-startable backup and restore for interrupted operations. Journal-based backups to expedite the process and minimize processing overhead. 4 Non-disruptive online image backup and restore. Rapid recovery by creating backup sets that consolidate files onto portable media. Automated backup schedules. Built-in and automated disaster recovery planning tools. Optional data protection features for popular , database and enterprise resource planning applications. Help enhance data security Storage administrators must ensure that data is backed up and secure, regardless of location, and that purposely erased data is irrecoverable. To help meet compliance requirements while maintaining productivity of personnel, Tivoli Storage Manager 6 generates, encrypts, stores and manages encryption keys for Tivoli Storage Manager 6 clients and application protection modules. Furthermore, Tivoli Storage Manager compresses and encrypts data that is being moved into the hierarchy of storage. Enhanced security features within Tivoli Storage Manager 6 include: Automated data security encryption key management to help relieve the burden of manually tracking encryption keys and passwords. Leverage tape-drive encryption to offload encryption from the system to the tape drive for faster backups and restores. Data shredding, or the overwriting of deleted data, helps to prevent future discovery. Can increase visibility into the data protection environment Tivoli Storage Manager 6 provides advanced features for operational monitoring and historical trends reporting. A customizable dashboard provides graphical views, while reports can be created in multiple formats such as HTML, Adobe Portable Document Formatting (PDF) and commaseparated values (CSV). Based on open source Eclipse Business Intelligence Reporting Tools (BIRT), this feature allows administrators to define their own customized reports. Help speed backups and disaster recovery Tivoli Storage Manager 6 offers numerous features to facilitate backups and recovery, including disk storage pools, backup sets, volume level backups, offsite copies, collocation and an integrated approach to protection of VMware environments. Backup sets are portable images created on the Tivoli Storage Manager server from existing backups. They can be used to: Create media for rapid recovery or instant archives. Restore individual files or point-intime backups of data to client systems locally, independent of or with a Tivoli Storage Manager server. Create copies for long-term retention from backup versions already stored on the server. 5 The active data pool storage feature stores the active version of data in a virtualized group of tape and optical media. This helps to conduct faster client restores and to greatly reduce the amount of data taken off-site. Application-aware protection and recovery management Tivoli Storage Manager 6 provides a full image backup of virtual machines for enhanced business continuity and disaster recovery. It integrates with VMware Consolidated Backup to coordinate the movement of virtual machine data from the VMware Consolidated Backup proxy server to tape devices. Additionally, Tivoli Storage Manager 6 supports the Microsoft Volume Shadow Copy Service for Microsoft SQL and Microsoft Exchange. By performing more frequent low-impact backups, you help minimize potential data losses and enable extremely rapid restores from local snapshot backups. Use NDMP backup images for onsite or offsite vaulting To heighten disaster recovery capabilities, use Tivoli Storage Manager 6 to protect data on NAS devices by using Network Data Management Protocol (NDMP). Use Tivoli Storage Manager to: Implement NDMP backups of NAS devices directly to attached tape drives or tape drives shared with Tivoli Storage Manager 6. Send NDMP backups to a Tivoli Storage Manager server to be stored on disk or tape. Create offsite copies of NDMP backups. Transfer NDMP-generated data to other storage media to reclaim unused space or to migrate data to more appropriate media in the storage hierarchy. Implement advanced backup and recovery functions To help meet increasingly stringent recovery point objectives and recovery time objectives, Tivoli Storage Manager 6 provides advanced backup and recovery capabilities, including: Individual item-level recovery for Microsoft Exchange databases. Individual object recovery for Microsoft Active Directory environments. File-level recovery for IBM System Storage N series and NetApp NAS environments. VMware full image backup and integration with VMware Consolidated Backup (VCB). 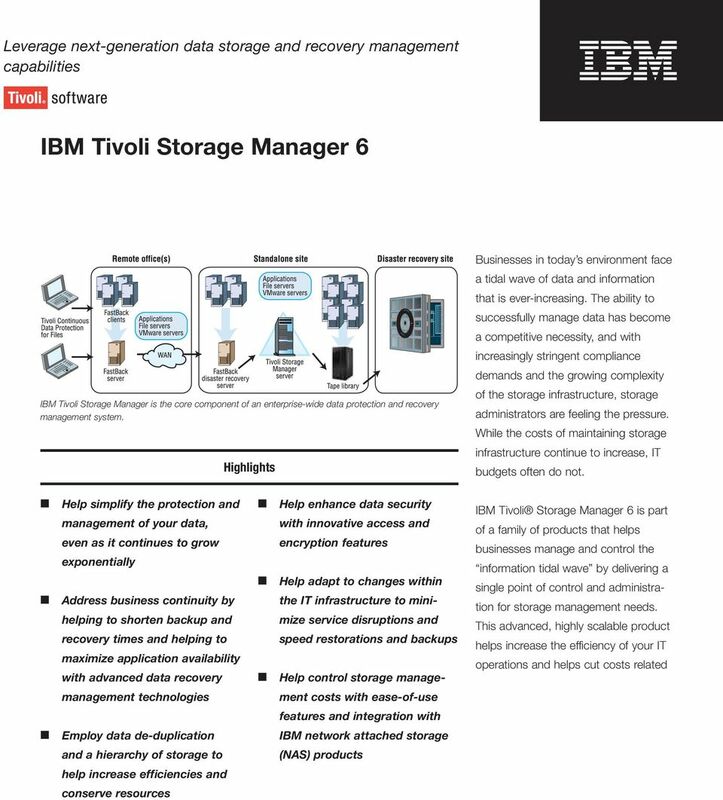 Tivoli Storage Manager 6 for a smarter, greener data center IBM Tivoli Storage Manager 6 is one of the premier data management solutions that leverage the capacity, performance and long-term retention features of the broad range of available tape systems. Magnetic tape is probably the greenest of all storage technologies, in that tape can store vast quantities of data for long periods of time, while requiring only minimal environmental (power and cooling) support. 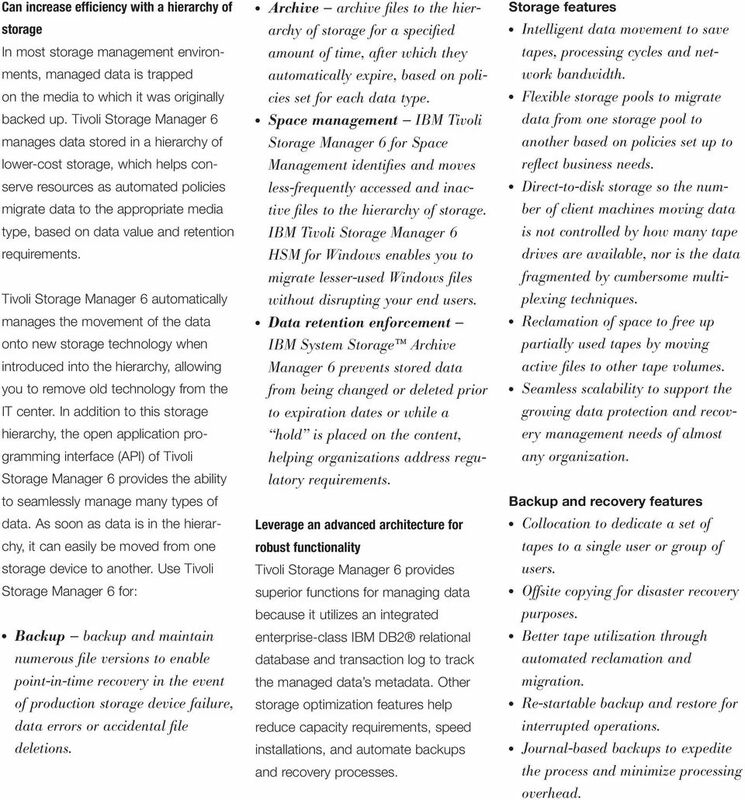 6 IBM Tivoli Storage Manager at a glance The Tivoli Storage Manager family of offerings includes: Tivoli Storage Manager automates data backup and restore functions, supports a broad range of platforms and storage devices, and centralizes storage management operations. Tivoli Storage Manager Extended Edition expands on backup, restore and archive abilities with data de-duplication and disaster recovery functionality. IBM Tivoli Storage Manager for Mail helps secure IBM Lotus Domino and Microsoft Exchange data, regardless of where or how it is stored. IBM Tivoli Storage Manager for Databases helps secure IBM Informix, Oracle and Microsoft SQL data, no matter where or how it is stored. IBM Tivoli Storage Manager for Microsoft SharePoint offers granular backup and recovery of your SharePoint business data and content. IBM Tivoli Storage Manager HSM for Windows provides Hierarchical Storage Management with a policy-based management system for migrating Windows files economically and transparently. IBM Tivoli Storage Manager for Advanced Copy Services protects your mission-critical data that requires 24x7 availability by delivering snapshot backup capabilities. IBM Tivoli Storage Manager for Copy Services delivers high-efficiency backup and restoration of data and applications, virtually eliminating backup-related performance impacts. IBM Tivoli Storage Manager for Enterprise Resource Planning helps protect vital SAP R/3 system data efficiently, consistently and reliably. IBM Tivoli Storage Manager for Space Management automatically moves inactive data to free online disk space for important active data. IBM Tivoli Storage Manager for Storage Area Networks allows SAN-connected Tivoli Storage Manager servers and client computers to make maximum use of their direct network connection to storage. IBM Tivoli Storage Manager for System Backup and Recovery offers a comprehensive system backup, restore and reinstallation tool that provides bare-metal restore capabilities. IBM Tivoli Storage Manager FastBack provides a continuous data protection and recovery management platform for Microsoft Windows servers. 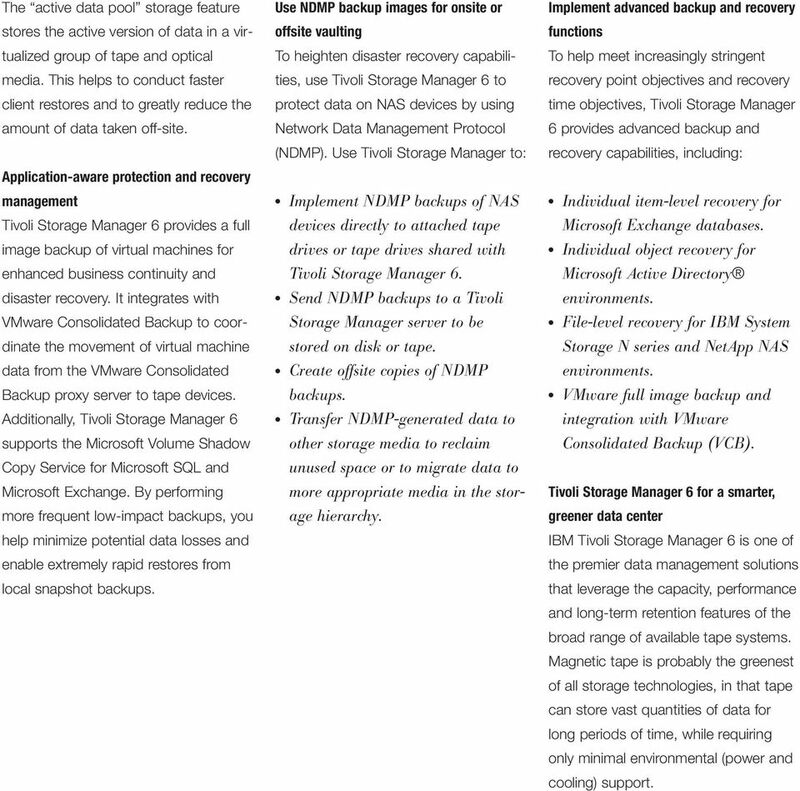 IBM Tivoli Storage Manager FastBack for Microsoft Exchange provides the ability to quickly and easily recover granular Microsoft Exchange data objects. IBM Tivoli Storage Manager FastBack for Bare Machine Recovery restores entire systems, whether to comparable hardware, dissimilar hardware, or a virtual machine. IBM Tivoli Storage Manager FastBack Center combines the features of the IBM Tivoli Storage Manager FastBack family of products into one solution. IBM Tivoli Continuous Data Protection for Files provides continuous, automated backup of desktop and laptop workstations. Service Description Data Backup and Restore (DBR) Terremark s Data Backup & Restore provides secure, streamlined online-offsite data storage and retrieval that is highly scalable and easily customizable. IBM Sales and Distribution Group June 2009. Next-generation data protection for midsize companies. Case Studies. Data Sheets : White Papers : Boost your storage buying power... use ours! BACKUP & RECOVERY ARCHIVE REPLICATION RESOURCE NAGEMENT SEARCH Key Benefits Offload backup operations from virtual machines to a Microsoft Hyper-V server eliminating backup agents on each virtual machine. WHITE PAPER: customize. Best Practice for NDMP Backup Veritas NetBackup. Paul Cummings. January 2009. Confidence in a connected world.